You might finally get the definitive answer on what the orb is. The truth will either stun you or, in my case, confuse the heck out of you. Bowler drops a bombshell on Brisco when they’re talking later in the Horseshoe Club. He’s thinking of retiring after they round up Pepe. Bowler talks of buying some land around Napa and starting a winery. Pepe is recruited by the government agents (after some harsh persuasion techniques) to steal an object out of a safe for them (three guesses what that object might be). Brisco is doing some reading in his room when a naked woman materializes out of thin air (and yet that’s never happened to me even though I do a lot of reading at night). She is Karina from the year 5502, a few millennia later than John Bly’s time. (As with the Terminator time machine it’s easier for her to travel back with no clothes.) Her people created the Orbs and send them into the past to aid humanity’s advancement. But Bly learned of the Orbs and traveled back in time to steal them. Karina says he succeeded in getting back to his time with them and taking over the world. Brisco argues that Bly is trapped in one of the Orbs. “Not for long,” replies Karina. In her future history this is the day John Bly takes the Orbs back to his time and begins a two thousand year long reign of terror. But Brisco can stop him. Karina can assist Brisco but not take any direct action herself while Brisco changes the timeline (i.e. Karina’s past). As you probably guessed the object Pepe is stealing is the Orb Brisco has stashed away in a bank vault. Pepe drops the rod containing Bly in the bank safe. He puts it back in the Orb but some blue fluid is left on the safe floor. After he delivers the Orb to the government men, they kill him. When the bank safe is later opened, a freed John Bly comes out. Brisco runs into Socrates at the bank. Socrates is evasive about why he’s there. Brisco follows Socrates to a cafe where he’s having a clandestine conversation. Brisco sends a runner for Bowler, who joins him outside the cafe where they can watch Socrates. They confront him and find out he’s become a government agent though he still does work for the robber baron tycoons as a cover. It turns out Agent Brown, the one who recruited (then killed) Pepe has gone rogue and wants the Orb for himself (and his crew of likeminded rogue agents). Brisco returns to his hotel room. Karina is gone but there is a federal agent who wants Brisco’s help with the Orb. He is obviously working for Agent Brown. Brisco and Bowler capture him. Brisco, Bowler and Socrates head to the location the rogue agent gives them for Brown. Karina catches up to them on the street (she’s wearing one of Socrates’ tuxedo jackets so now she’s just scantily clad instead of naked). The place they’re going is the spot where in her history Bly gets the Orbs and returns to his own time. Bly is still in 1894 powering up the Orb. Karina tells Brisco he needs the other Orb (the one that he took from himself in a previous episode). Bly is trying to open a door to his time in the future but Brisco can use that door to travel back to get the other Orb. Brisco confronts Bly but Bly is already able to channel enough power from the Orb to be impervious. When Bly opens a time portal Brisco dives through it leaving an angry and frustrated Bly behind. Now we see the other side of what was going on as Brisco arrives back at the secret Nevada facility and takes the Orb after a conversation with his earlier self as seen before. Back in the present, Brisco uses one of the Orb rods to power up video game style before looking for Bly. Bowler tries to stop Bly but Bly freezes Bowler in place then shoots him. Bly tries to shoot Brisco but he has the same invulnerability to bullets as Bly now. A fistfight between the two men ends with Bly being flung out a window and falling to his death. But Bowler is dying. Brisco brings over an Orb for Bowler to touch but it doesn’t heal him. The Orbs know Bowler doesn’t like them so they won’t work for him (man, are they judgmental). Bowler succumbs to being a few days from retiring and dies. If only there was some way to turn back time and prevent Bowler from being shot. But how? Brisco decides to go back in time again to save Bowler. Karina opposes the idea since Bly is dead and if Brisco does back to change things he might not not be able to stop Bly this time. She powers up one of the Orbs so she can travel back to her time with them. Of course Brisco dives through this time portal as well. He returns to when he came back with the second Orb. Things start to play out as before except this time Brisco grabs an Orb rod, throws it and knocks the pistol out of Bly’s hand before he can shoot Bowler. But this time Bly runs off instead of fighting and being killed by Brisco. Bly pops up again about to return to his time. But he needs the rod that Brisco still has. Brisco thrusts the rod into Bly’s torso. Bly disintegrates into a pile of fine ash. Karina powers up an Orb, drops the tuxedo jacket and travels back to the future with the Orbs. Bly and his gang have been dealt with so what’s next for the two bounty hunters? Bowler has decided he’s not ready to retire just yet so the partnership is still on. President Cleveland shows up in San Francisco and speaks to them. The President wants them to keep up their bounty hunting but to do occasional jobs for him that “fall outside the purview of normal government agencies.” Of course their contact for assignments will be Socrates Poole. The three men walk off for some pinot noir as the sound of the show being retooled is heard in the background. The Orb story gets complicated fast in this episode with all of the time travel. But I followed what was going on back when it aired and in a way this episode helped prepare me for the time travel stuff in Voyager, Enterprise and 12 Monkeys. But only The Sarah Connor Chronicles used naked time travel. Karina gives a technical explanation of the Orb. It is a “man-made electromagnetic wave particle net that captures energy at certain nodal intersections of the space-time grid.” Got that? Good. 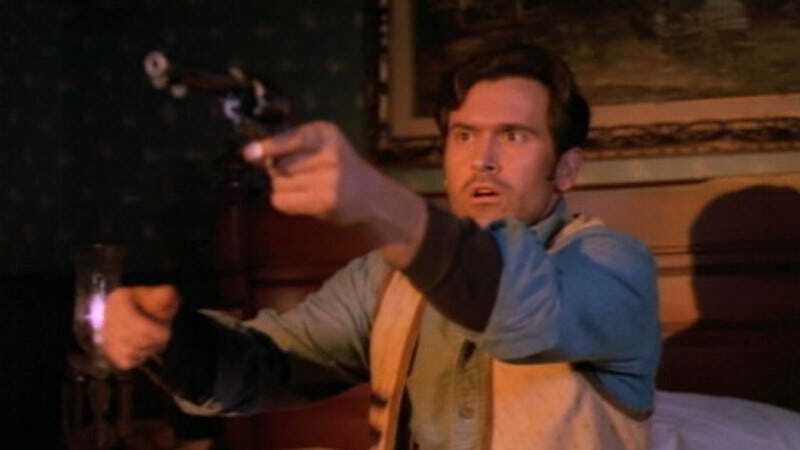 The story starts with Ned Zed, one of the twelve members of Bly’s gang who shot down Brisco’s father (remember this takes place before the events of last episode), robbing a bank. Socrates is also be in the town of Mishap to get a progress report for the tycoons. Brisco confronts Ned and his gang as they leave the bank. Ned lights a wagon full of dynamite on fire forcing Brisco to drive it out of town to explode safely while Ned and his gang escape. Socrates returns to San Francisco and the Westerfield Club (again this is before it was blown up) and meets with one of the tycoons. This one is a banker planning a trip to Lumberville, Washington to attend the opening of a new branch and personally receive the first deposit of cash. Sounds like a good opportunity for a bank robber. Brisco arrives in Lumberville on the trail of Ned. He checks into a hotel and ends up sharing a room with Bowler, who says he’s in town on different business.. He’s transporting a payroll for the hotel owner, who also happens to be an old flame of Brisco’s. They were engaged before she ran with a West Pointer a week before the wedding. At dinner with his old flame Frances, Brisco meets Frenchy Bearpaux, who seems a bit too interested in who Brisco is. Frances then invites Brisco up to her room to finish a bottle of wine. .Frenchy Bearpaux returns to his cabin where he meets with Ned and his gang. Ned isn’t pleased that Brisco is in town. Frenchy offers to take care of Brisco for Ned because he has a personal grudge. He also reveals that his left hand has been replaced with a bear paw (he’s been wearing mittens so this is the first look at his hands). The controls for the saws and conveyor happen to be in reach and Brisco gets a handle in his mouth and stops the log and saws in the nick of time. Frances arrives at the sawmill and frees Brisco from the ropes tying him to the log. They ride off looking for Frenchy but run into Bowler, who is being chased by bandits. Bowler is holding his own so Brisco and Frances continue on to Frenchy’s place. Brisco and Frenchy end up fighting in a clearing surrounded by beartraps. Brisco bests Frenchy and takes his bearpaw. Meanwhile Ned has been outfitted with a metal suit. He can take the helmet off by himself but not the rest without being cut out of it. He also has a machinery gun custom made to go with the armor. Looks like it’s bank robbing time. Socrates and the banking tycoon are at the new bank where the tycoon has received the first deposit. Brisco and Frances arrive to warn about Ned Zed. The tycoon is confident since besides Brisco there are a couple of Pinkerton men in the bank. An armored Ned arrives and drives off the private security with his machinery gun. Brisco literally pulls the rug from under Ned’s feet leaving him on his back then ducks into the bank vault with Frances, Socrates and the tycoon. Socrates shuts the vault door but doesn’t realize only he and the tycoon have the combination to the door. Bowler arrives in town with the payroll. Ned robs him and leaves. The four in the vault hear someone outside. They read off the combination and the vault door opens to reveal that Comet is the one who opened the vault (but it took him two tries so maybe he isn’t that smart). Brisco rides out on Comet looking for Ned Zed. Ned’s escape is slowed down by the weight of the armor tiring out his horse (and his henchmen’s horses when he takes them). He has ditched both helmet and machinery gun by the time Brisco catches up to him. Brisco unhorses Ned then channels him into the clearing of beartraps where Brisco captures him. Ned Zed is taken off by federal troops. Frances in her fickleness has become enamored with the officer in charge. It’s time for Brisco and Bowler to leave. Right after the father and son finish the story there’s a rattling at their hotel room door. A familiar pair of bounty hunters are standing there trying their room key in the wrong door. They apologize and shut the door on the astonished father and son. This is one of my favorite episodes though I don’t know why it was shown so late in the show’s run when it takes place so much earlier. It’s over-the-top but still works, maybe because of the dime novelization of the story. With the end of the Bly storyline Brisco County Jr. becomes more of a tongue-in-cheek Western than anything else. As much as I like rewatching the show and doing recaps, I don’t think I can really justify doing the ODeck recaps now that we’re past the genre episodes. For now Brisco, Bowler, Socrates and Comet will ride off into history.